Whenever fans approach psychic Dougall Fraser, they will inevitably confess some burning secret and then say, "But you knew that already!" Dougall wants us to know that we, too, know much more than we think we know -- that we all have access to a whole range of psychic abilities -- and that he's the one to show us the tricks of the trade. Sorting out truth from fiction, Dougall shares his personal experiences as he hilariously uncovers the scams, slights of hand and mind that have psychic devotees pouring hundreds of millions of dollars out of their wallets unquestioningly. He tells us the inside story: How do the psychic hotlines function? What does a psychic impression really feel like? 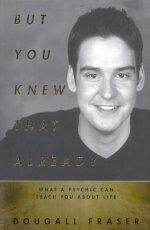 Dougall's irreverent humor and dead-on predictions are destined to turn even hard-core doubters into willing and eager believers.